As the name suggestsClematis koreana 'Candleglow' produces nodding flowers that resemble the flames of a candle, with a red / purple base changing to flame-coloured yellow at the tip. Prominently ribbed tepals appear from May to September, and the flowers are followed by seed heads which continue the attractive effect. There may be a second light flowering in August. Clematis koreana 'Candleglow' was raised by Vince and Sylvia Denny of England. 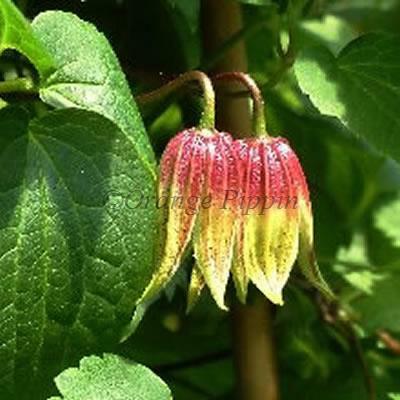 It was named and introduced in 1999 by John Richards of John Richards Nurseries Ltd, Colwall, England. It was originally known as 'Denny's koreana Number 5'.